It just occured to me that I have yet to share with everyone the school that I go to everyday. 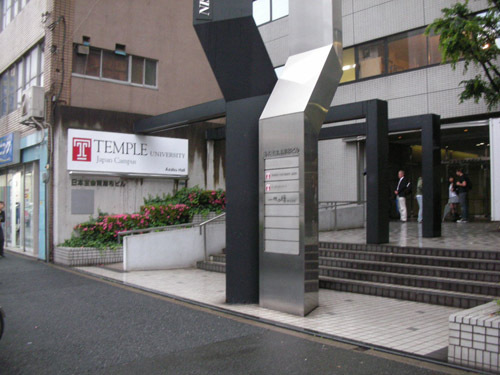 I attend Temple University Japan. 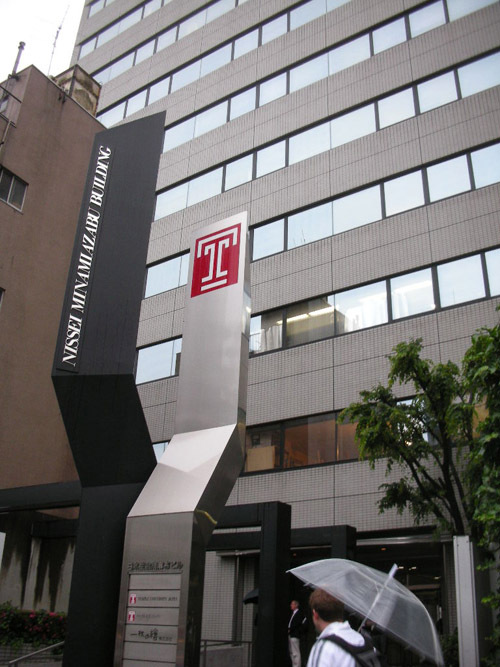 TUJ is a campus of Temple University in Pennsylvania. For the past 20 years or so they've had a campus in Japan. Recently in the past few years they finally received recognition from the Japanese Ministry of Education meaning that my diploma will be legit in both the US and Japan when I graduate. 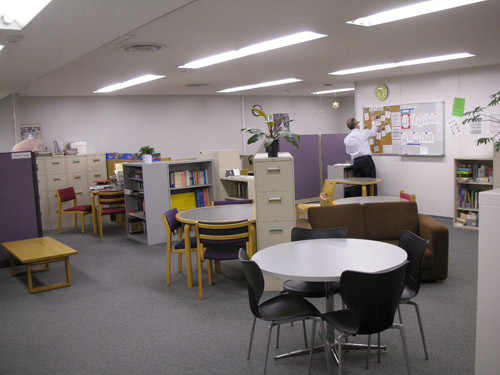 The campus is actually pretty small, consisting of two mid to large size office buildings and a satellite building used for adminitrative purposes. 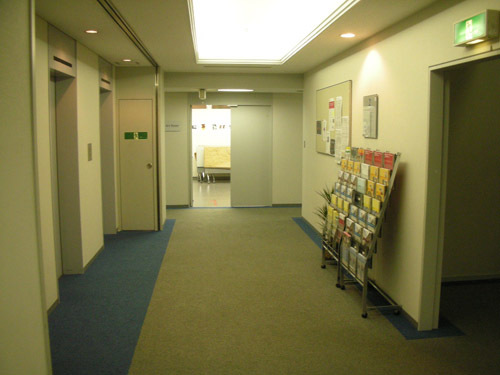 The two buildings are refered to as Azabu hall and Mita hall. 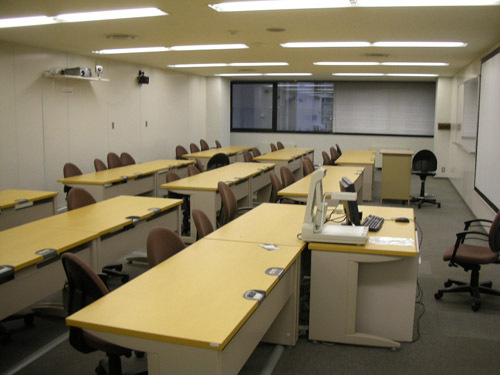 All my classes are in Azabu hall and that's where I spend all my time when at school so that's what I'll be sharing with all of you today. 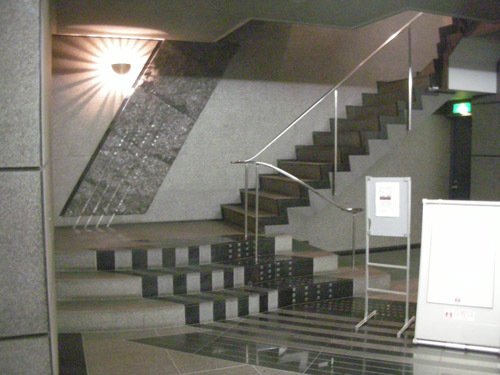 This is the entrace of Azabu hall as you walk up onto it from the street. Here we are meeting up with some other Temple students at the entrance to the building. On the left you can see Josh with his usual way too happy smile on his face. This is what you see on every floor after you exit the stairs. 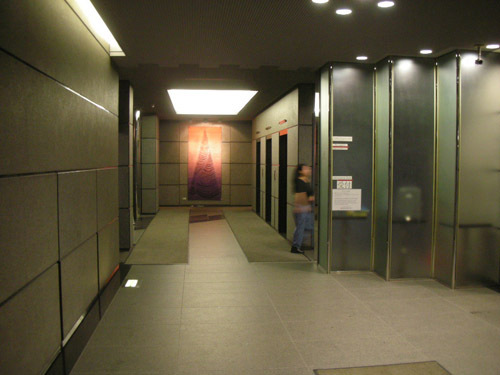 On the right is the entrance to the stairs, the left, the elevators for the lazy people. Directly in front you can see the art majors area and the hallways to the cafeteria, student gov't room, and some classrooms. Behind me is more classrooms and the TLC. I don't really like to spend much time here because I have such little respect for artists and their over emotional demeanor and 'deep thoughts'. Also, many of those anime obsessed mal-adjusted freaks who wear cat ears to school and place japanese words (such as kawaii) into English sentences to try to sound cool call this place home. 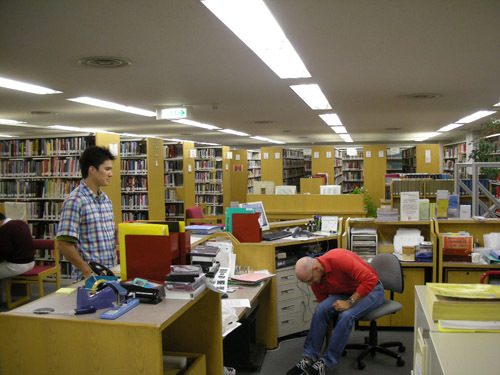 This is the TLC (The Learning Center) which is a free tutoring resource offered to all the students. Last semester I worked as an Economics and English Writing tutor, boy did those students get jipped. Moving on towards the cafeteria we walk into the student lounge with the student gov't room entrance in the back. 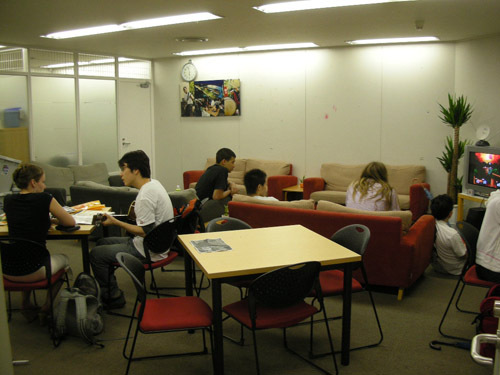 Many students hang out in here during lunch to study, play video games, and lie around. 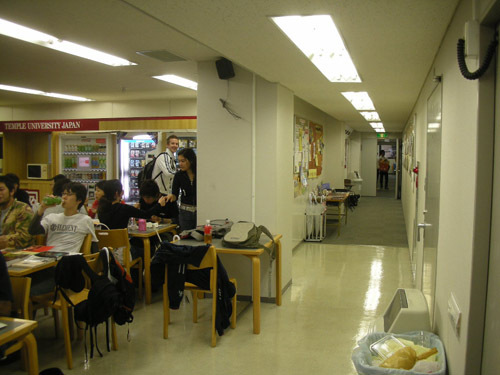 This is the hallway as we walk away from the student lounge (on the left). 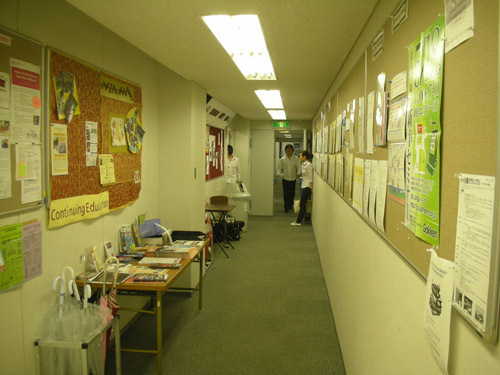 On the left wall you can see posting for student clubs that're offered (such as fight club, archery, karaoke, etc). 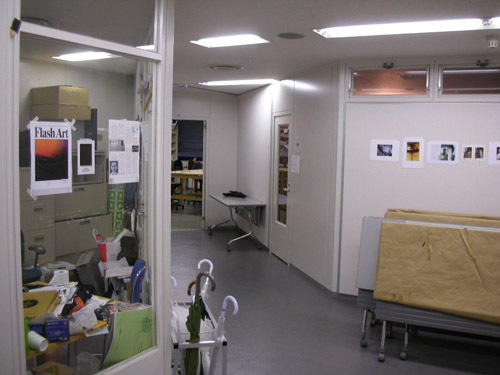 On the right wall there is information for internships offered to TUJ students. Here we are continuing to walk backwards as far as we can into the 'cafeteria'. 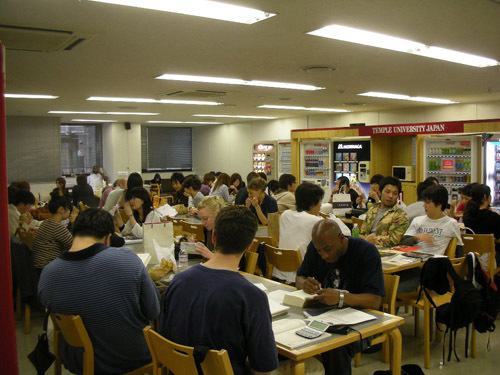 When I say cafeteria I really mean to say a room that's way too small with some vending machines where people bring food in to sit and eat. During lunchtime though this american chef sits in the back corner and offers american meals for around $8. Alright here we are now on the 5th floor sitting in one of the 4 or 5 computer labs checking on myspace. 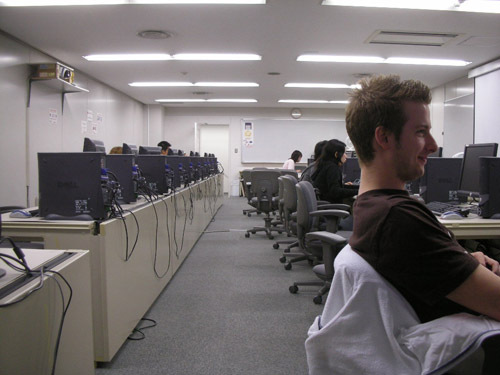 Here is what the average classroom looks like in Temple. Each table has electricity and internet available (although most people just use the wireless in the building) and a LCD projector which the professors frequently use. 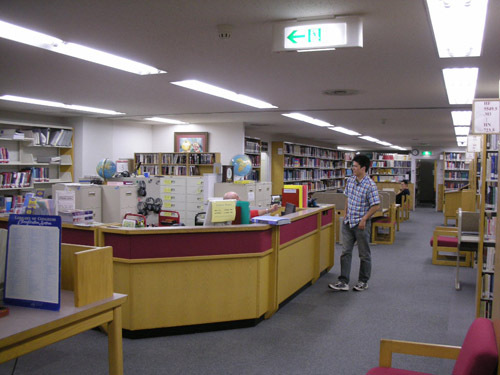 This is the 4th floor English library. We used to claim that it was the biggest in the Tokyo area...but...c'mon, that's such a dirty lie. On the plus sides, we get in magazines and newspapers from the states on a regular basis along with the US release of DVDs which the students can rent for free. 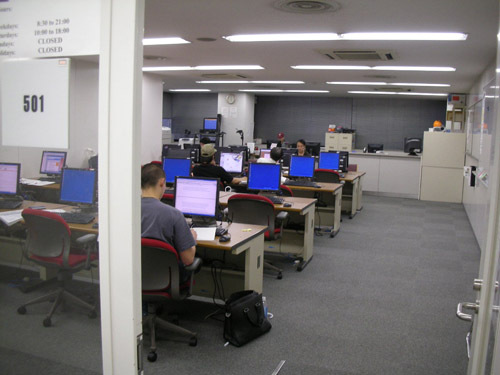 here is the main computer lab where most of the students do their printing for classes. Around finals time, this place is a zoo of lines of people waiting to use the printers to print off term papers. That's pretty much about it. This was a really short tour I know, but I only wanted to share where I go everyday. The actual campus is a bit bigger then this (not by much though). Anyway, the last picture is some of my friends which I see everyday after classes. From left to right it's Risa, Erika, Yukari, and Josh. been keeping busy i see. way to go getting your licence by the way. see ya around. wow, good luck, mang. i heard about u leaving to Japan. I think i met u before at D1 with Thomas and Scott. so, far, sound like u are having alot of fun over there. wow. your pretty much awesome. thats the exact university i wanna go to. i went to japan last summer and am going again this month. im gonna try to catch the car scene. talk to me on myspace, if you want. Whats up with cursing the artists? Were you serious? I'm not there to see how they behave, but everybody deserves respect. did a good job! I like looking for my self in your pictures.